Our selection of muzzle brakes represents the traditional as well as the exotic but always with the emphasis on accuracy, functionality, and value. When accuracy is a priority, installation requires proper centering and alignment. And, even though the crown of the barrel is out of sight at the rear of the brake, it is extremely critical to the accuracy of the firearm after the installation. Muzzle brakes and magnaports, also referred to as recoil compensators... Reduce kick and muzzle rise. Our muzzle brakes include proper, precision installation to reduce recoil, retain accuracy and velocity while making your rifle or handgun comfortable to shoot. Our selection of muzzle brakes represents the the traditional as well as the exotic but always with the emphasis on accuracy, functionality, and value. When accuracy is a priority, installation requires proper centering and alignment. And, even though the crown of the barrel is out of sight at the rear of the brake, it is extremely critical to the accuracy of the firearm after the installation. For this reason, our muzzle brake installations are secured in place with Loctite and not intended for you to take them off and on (like the loose fitting threads of a flash suppressor, for example). 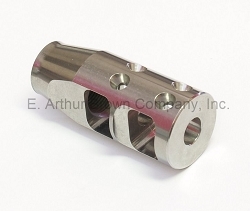 Installed muzzle brakes are a custom machining and Gunsmithing service that we perform here at E. Arthur Brown Company... delivery is approximately 4-6 weeks. 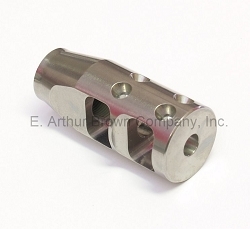 On-Center Threaded Brakes - Our muzzle brakes are all threaded on-center with the bore. This assures that the exit hole is aligned with the bullet path and that ignition gases affect the bullet equally on all sides... which is the best condition for accuracy. C-T-C 11º Target Crown - After the muzzle is threaded and before the brake is installed, we cut the crown. Our crowning system aligns the muzzle and the chamber between centers (C-T-C) to assure that a perfect crown is cut. This crown is inspected with a loupe to be sure it is perfect before the muzzle brake is installed. No-Stress Mounting - Our muzzle brake threads are snug with no wobble... again to assure alignment and accuracy. Beyond this, we install them with a zero-torque method to be sure no stress is introduced into the barrel. And finally to assure accuracy, they are sealed in place with red loctite. Ordering Custom Shop Work On-Line - Our shopping cart system allows you to completely enter an order, get the total price calculated, and submit it to us prior to sending in your gun for the work to be done. In the payment section of entering the order, you can confirm the order and give a credit card as payment method. Please fill out and enclose our WORK ORDER FORM (pdf) with your barrel or gun. Finally, please call or email if you have any questions... We're here 9-5CST, M-F.
1. Will A Brake Hurt Accuracy? A properly installed muzzle brake WILL NOT HURT ACCURACY. In fact, a brake that we install here at EABCO will very likely improve your accuracy... Our alignment and target crown achieve this. 2. Will A Brake Reduce Velocity? No... The brake itself has little or no effect on the velocity of your bullets. Barrel length determines velocity. If you want your barrel shortened during the brake installation, the shorter barrel will reduce velocity... But it won't be due to anything from the brake. 3. How Much Recoil Reduction? It's impossible to give an exact amount of recoil reduction that you can expect. Guns differ in length, weight, and barrel height above the stock. Shooters may "perceive" recoil differently than other shooters. And of course different cartridges, bullet weights, and loads will recoil differently. We have attempted to give a rough idea in the muzzle brake descriptions, BUT... We have to say words like "Up To X%".